Do you suffer from Lyme Disease, Chronic Fatigue, Multiple Sclerosis, Fibromyalgia, or other chronic illness? If so, this book is for you! This highly-anticipated release from Dr. David A. Jernigan brings new and updated information AND provides the actual 'how-to' of healing for patients and doctors seeking to facilitate healing from Lyme Disease and other related illnesses. This book centers around Dr. Jernigan's new Perfect-7 Treatment and Detox ProtocolTM, detailing recommendations to promote healing in all aspects of life. 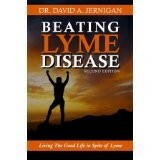 Additional topics presented in this second edition of Beating Lyme Disease include further explanation of the body seen as a crystalline matrix of light, new cutting-edge products to assist in the body's detoxification and optimization, and discussion of the growing validation of important connections between emotional and physical health. If given the proper tools, the body can heal itself! This book provides tools that have helped hundreds and thousands of people gain the quality of life they desire.